More than 8600 square feet, our unique spa at Desire Pearl is surrounded by the beautiful Caribbean sea and green jungle, offering the ideal refuge where your mind and body will be harmonized and your senses awaken. In our six spacious spa treatment rooms, you will find an ideal ambiance for ultimate relaxation while our intimate Spa Couples Suite, with private lounge and jacuzzi terrace, allow our treatments to be enjoyed with your significant other like no where else. Complementing our Zen-like oasis of relaxation; Yoga, Pilate's, stretching and meditation sessions are performed under the property's picturesque Palapa. And for a wonderful workout, our fabulous gym, offers you the most modern fitness equipment so that you can be inspired to keep in shape during your clothing optional vacation with us. 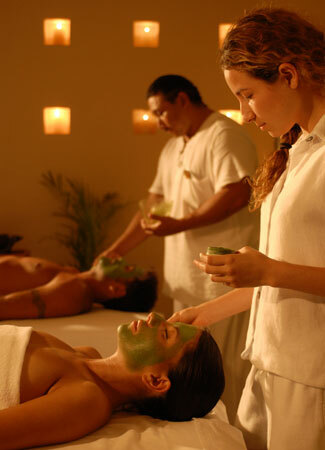 Our therapists who use a selection of different essential oils and aromas, invite you to enjoy a facial treatment, your favorite massage, or our exclusive couples treatments, ensuring a total sensual experience hard to compare, in which the arts of relaxation and indulgence are enhanced.